If the name Jack London rings any bells at all, it likely brings to mind vague images of huskies and sleighs. The author’s most enduring novel, 1903’s The Call of the Wild, remains a staple for grade school reading across the U.S. But because his legacy has been so closely bound up with childhood reading, London’s adventurous and sometimes sordid life is much less familiar. When he died on November 22, 1916, at only 40 years old, he had lived more than most. The Call of the Wild indeed captivated the country with its fascinating portrayal of the perilous Klondike gold rush. The story propelled London to celebrity status as a pioneer of American magazine fiction. Telling the tale of a heroic dog named Buck, the novel is a landmark in America’s long love affair with nature writing. By writing the experience of man’s best friend, the author managed to include many of the complex moral and social questions he grappled with. “The proper function of man,” he said, “is to live, not to exist.” A fascination with surviving and thriving runs through The Call of the Wild and the bulk of all London’s writing. So who was the literary genius behind this enduring classic, and what kind of life bred such nuanced ideas about human nature? Born in San Francisco in 1876, London described his early years in terms of struggle, the theme that dominates his fiction and colored his strong convictions. In a body of work spanning adventure, memoir, and science fiction, he returned again and again to situations which tried the human (as well as canine) spirit. London’s own life was a yarn for the ages as well. Revisiting a bit of the author’s wild ride can help us appreciate his uncanny insight into the world, and humanity’s never-ending search for a place in it. 1. BEFORE BECOMING A SUCCESSFUL WRITER, HIS OCCUPATIONS INCLUDED BOTH OYSTER PIRATE AND DRIFTER. 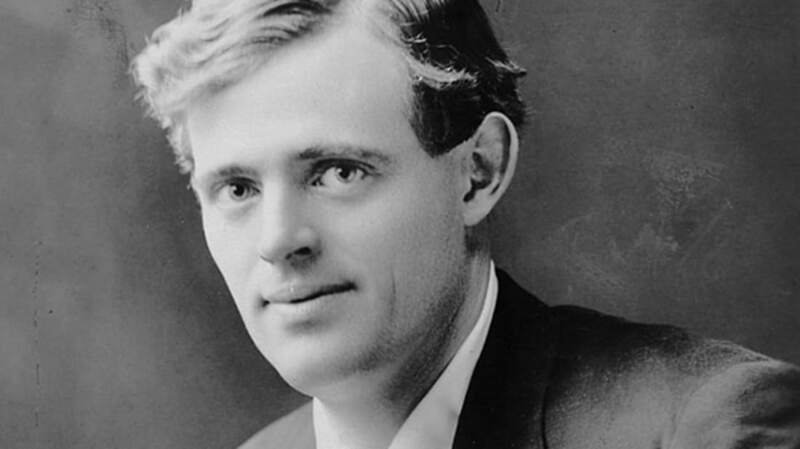 Jack London’s life was anything but conventional. Never a stranger to hard work, he started earning wages for his family at a very young age. As a teenager, resenting a soul-crushing job on a cannery assembly line, London turned to sketchier means of making a living. Borrowing $300 from his boyhood nurse, he purchased a small boat to poach oysters in the privately controlled beds of San Francisco Bay. A few years later, once more dodging the grueling manual labor of the unregulated industrial revolution, London took to the train tracks with a group of so called "road-kids." “I am a fluid sort of an organism,” he wrote, “with sufficient kinship with life to fit myself in ’most anywhere.” His drifting took him across the country and even landed him in a brief stint in prison. At 19, London wised up and went to high school. 2. THOUGH HE FAILED AS A GOLD PROSPECTOR, THE KLONDIKE GAVE HIM MATERIAL FOR HIS BEST WORK. The discovery of gold in the Yukon lured London with the promise of quick riches. Outfitted by his brother-in-law, he joined the rush in 1897 but proved an unlucky prospector. “I brought nothing back from the Klondike but my scurvy,” the writer later declared after wringing just a few dollars’ worth of gold dust from gold fields. However, he did manage to extract something precious from his experience: larger than life characters and a fascination with survival in nature’s extremes. These are the hallmarks of his writing which fueled his rise to fame. When London sailed for Alaska en route to the Yukon, he brought with him books by Charles Darwin. The ruthless nature implied by Darwin’s theory of natural selection—survival of the fittest—abounds in London’s work. The Klondike of The Call of the Wild is quite literally a dog-eat-dog world, in which London lauds resourcefulness and strength of will above all else. 4. HIS RICH BUT PLAIN DESCRIPTIONS OF NATURE FORESHADOWED THE SUCCESS OF MODERNISTS LIKE HEMINGWAY. Much of London's success was garnered through magazine publishing; he gained celebrity and fortune from his writing alone as mass-scale printing became cheaper and more people became literate. It’s just one parallel to Ernest Hemingway, who followed in London’s footsteps. The two also share stylistic preferences for plain-spoken portrayals of nature and an economy of words—traits Hemingway is often given credit for popularizing despite coming after London. Indeed, certain passages of London’s finest prose, like his short story “To Build a Fire,” could easily be mistaken for Hemingway’s. 5. HE WAS AN OUTSPOKEN SOCIALIST WHO ADVOCATED FOR THE RIGHTS OF THE DISADVANTAGED. The writer’s unconventional formative years left a lasting impression on his worldview. Upon his return from the Klondike, London became involved in San Francisco’s burgeoning socialist political scene. He was apparently so fervent in his political beliefs, when London met and courted Russian-born socialist student Anna Strunsky in 1899, she likened meeting him to meeting a young Karl Marx. Perhaps in spite of his sober realism towards the tough nature of life, or perhaps because of it, he wrote extensively on the need to protect the dignity of workers and the disadvantaged. It’s just part of the legacy left by one of America’s masters of popular fiction—an American pioneer in more senses than one.